Charts and Kits. New things are added to both pages, so don't miss out! These are some of our customers' favorites! Bent Creek has a primitive and 'earthy' design style, that they've used to create some timeless designs. Simple, yet creative, you can embellish many of these with the specialty threads and embellishments on the market. 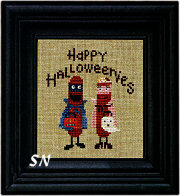 Patriotic, Samplers and Alphabets, Halloween, Christmas... they cover everything! Lots of overdyed flosses are called for! The kits, especially the "Zippers" are so popular! Enjoy Browsing! The main border chart that surrounds everything is separate -- 335 x 80 in stitch count, it finishes approx 22 x 3 on 30ct Week's Straw Linen, and it comes with more snaps and seven colorful buttons. The Auto-Ship is now completed for this design. Finally, Merry Wishes is the third installment in District 25... a peppermint and evergreen chalet! All are stitched on anything you want in overdyeds or DMC's -- your choice! Offered as three separate charts, each with a snap embellishment. Bent Creek has sent a three-story house -- just like North Pole, The Haunted House, and The Green House -- only it's on ONE chart! Real cute, we see the Oval Office on the first floor... I don't think they've signed the Declaration yet! Second floor features Betsy sewing the first flag... there's a little mouse there watching! Third story features the White House museum -- portraits and such. Here's an additional 'story' for your Haunted House... or just another smaller piece to finish as a little cube stand-up to display near-by the *Main House! * Same design size and flavor... add another panel to your Petrified Party piece if you dare! We never get Dr Jekyl... or any mad scientists at all... so this design is absolutely OVER-THE-TOP creative and too darn CUTE! 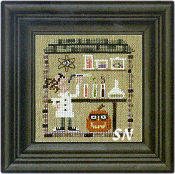 Check out the atomic symbol on the wall, the bubbling potions in the test tubes, his hair and black Converse shoes! 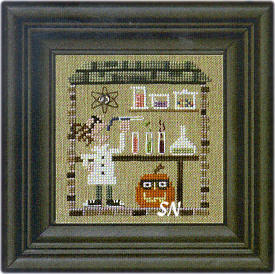 The Secret Lair is here now, and offered as a small Snapper Chart that includes a snap embellishment (for the center of that atomic symbol!) Basically the same color scheme as the rest of the designs in the main Haunted House. SOOO much fun! Bent Creek has begun this year's set of Snapper Cards... a set of 12 designs -- seasonal/monthly in theme -- featuring a very important Red Thread in each small pic. So, January's little snowman has a red scarf that will twist and meander through the year, tying all 12 designs -- that are destined to be together -- together!!! Small cards are available separately and include their own snap embellishments. 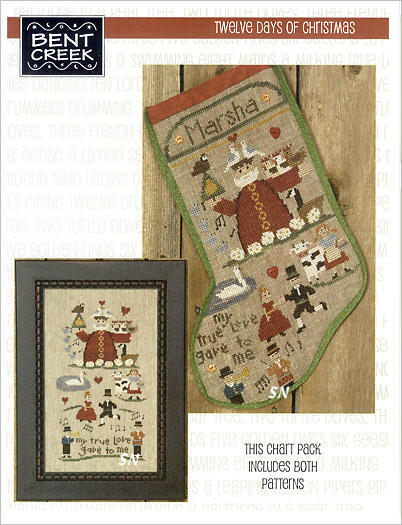 Border chart includes the clay and extra snap embellishments. The last in the Summer Snapperland set is finally here! The first design is darling... it's a tiny beach house, complete with a whale weathervane and little red crab on the sandy beach! 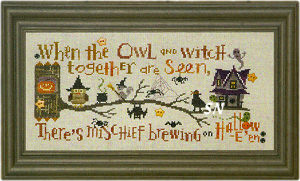 We will finish the year with Autumn Snapperland... a 4-part set that includes its own border chart and embellishments. You can still get all the preceding sets, as well! 'There are always flowers for those who want to see them!' 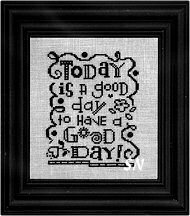 Spring Snapperland has arrived -- a 4-part set of small charts -- it features an optional freebie border chart that fits the 4 designs together surrounding them with that wonderful quote I just mentioned! 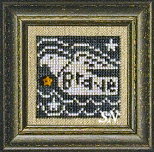 Stitched on 32ct Twilight Blue Belfast Linen in lots of overdyed goldens, oatmeals, mosses, and browns... the Spring Snapperland set has 4 small card designs. Each includes a pack of metal snaps -- the required embellishments. 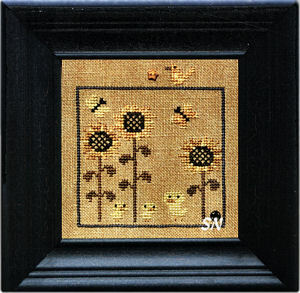 Stitch each individually... or join them together within the charming border design... it features its own embellishment set that includes some clay ladybug and bee buttons, and lots more snaps. Get everything open-stock... or join the order all at once... stitch the parts you like best -- which, for me... is ALL OF IT! Just starting this series? Then be sure to check the original set, Winter Snapperland. 'Autumn is a second Spring, when every leaf is a flower.' Bent Creek's final celebration of the Four Seasons -- in Snapper Card Designs! 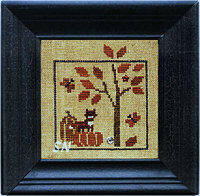 Presented in 4 small individual designs, Harvest Time is the first, with the barnyard and scarecrow outside. Autumn Walk is the second... the trees wander and follow the hikers a bit. Pumpkin Hunt and Turkey Farm finished it up!!! 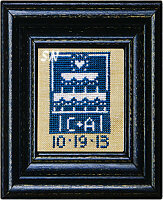 Each square design is a small 'Snapper' card, that includes a snap as its embellishment. Tying all these small squares together is the complimentary border chart and embellishment package... just like we have been treated to for Winter, Spring and Summer Snapperlands!!! A really cool series... we just finished an auto-ship for the rest of the cards in this set. You'll recall Snapperville... the set of 6 houses and businesses... a little town. Then, we were treated to Spring, Summer and Winter Snapperlands -- each of these containing 4 card designs, the border chart and embellishment packs. Quite a collection... each of the seasons or little town are charming, and definitely customer favorites!!! or... as we call it: "Chillville!" 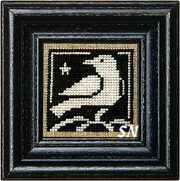 The embellishment pack contains the extra snaps, snowflake buttons and a white winter bird. Stitched individually, each card's design will measure approx 3 x 3. 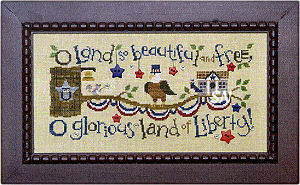 Stitched with the surrounding border, the entire piece will measure approx 5 x 17. The Winter Chillville fabric cut is actually a 1/6 yd piece of linen measuring 12 x 27, slightly larger than 3 inches of allowance of each side... but economical to cut! Wow... this is the cutest new set of six designs... each is part of a village affectionately named Snapperville!!! Offered over the next 4 months, Bent Creek is releasing 6 small cards... each cute by itself... but even cuter stitched together with its mates. 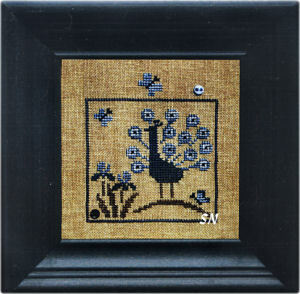 Each card features a set of snap embellishments and measures approx 3 x 3 on 32ct Natural Linen. There is a master chart -- a FREEBIE with Snapperville card purchases -- it has a swirly border, some skinny pine trees, and this verse: Teach us that we may feel the importance of every day of every hour as it passes. Very "Benty Creeky," we like to say in the shop... this is stitched in both Weeks and Gentle Art flosses, and finishes approx 4-1/2 x 23-1/2 when all is done. The embellishments for the master chart feature silver snaps as the stars in the sky over Snapperville, and clay buttons of a blackbird, brown bird, star, and little gold berry. Endearing! The final card in the tiny village scene has arrived to finish out the village of Snapperville. 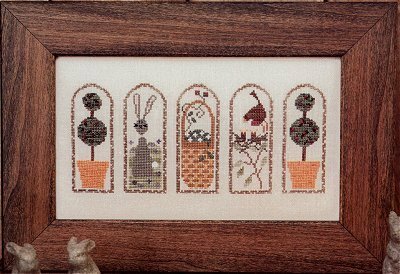 The freebie border verse that we offer with this small set speaks of taking time to appreciate the finer things in life. 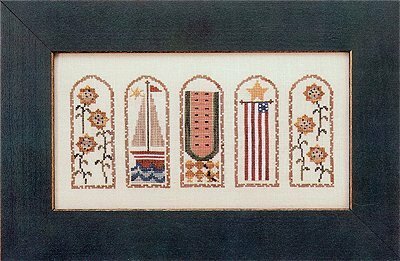 You could stitch each of these six designs individually, but together with that border design, this is one of Bent Creek's more charming creations. 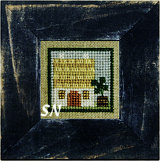 Our Angie stitched the shop model... isn't it cool? A long and narrow reminder of the reason-for-the-season... angels. the three wise men, and Holy Family... the stitch count of this is 310 x 30. 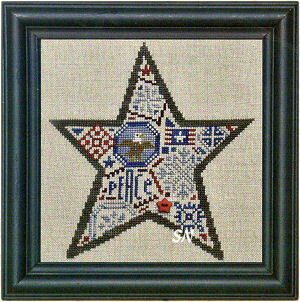 Choose any fabric you like; charted for DMC or hand-dyeds... this finishes approx 19 x 2 on 32ct. Presented as a chart. *A Journey of a thousand miles must begin with a single step. * Good Advice to face the challenges of life! 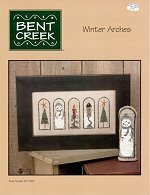 Bent Creek's newest chart features a forest of evergreen trees dotted with cardinals and snowflakes. Their verse is hidden in the alphabet letters... and they have highlighted the word BEGIN in there -- which actually spells that way in alphabetical order! The model is stitched on Weeks 30ct Confederate Gray linen with various hand-dyed flosses. It finishes approx 18 x 4. You can put this on most anything you want... and I think it'd be an awesome to design to showcase some neat unique green threads from your stash!!! Presented as a chart with 5 small flake/flower buttons. 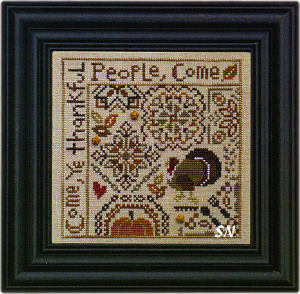 The stitch count is 281 x 29 - so on 14/28ct, this finishes approx 19 x 2. Might be kind of fun on 18ct over two! Jazz it up alittle -- add more buttons. The chart comes with one purple heart button. Whatever -- lots of possibilities! Bent Creek's newest ROW pattern, this one finishes approx 1 x 12 when worked on 32ct. We're love the verse, but we're thinking you might want to brighten this up a little -- the stars are purple and gray... they could use a little perking up!!!! An easy fix for a lovely thought! 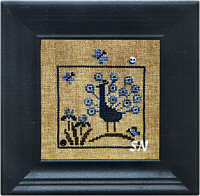 Offered as a chart with smattering of crystal seed beads. Oh my gosh... isn't this the cutest thing? A row of those funny gnomes who hide in your garden, only one is actually working!!! 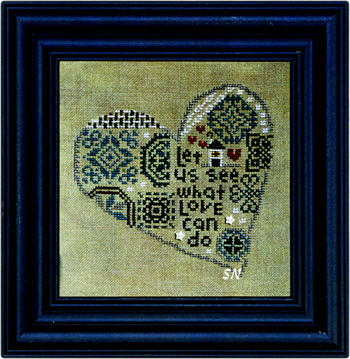 Offered in chart format, this is stitched on 32ct Natural Linen in overdyeds or DMC flosses - your choice. Finishing approx 2 x 17, the chart comes with one brass flower charm. THINK of all the cute clay stuff we have to dress this up! Worms and bugs birds, little flowers and vege buttons, see what you have on hand, then give us a budget! DARLING! Here in plenty of time to stitch for next Christmas, Bent Creek has a new alphabet row that incorporates Quaker-inspired motifs into a Christmas theme. I like those trees on the ends. Offered as a chart, the stitch count is 277 x 33, which finishes approx 17 x 2 on 32ct. Again, lots of possibilities to add little buttons and what-nots... although Quakers were simple people who didn't believe in embellishment and extravagance! This is a cute row... we rarely get circus-themed designs, so this is a refreshing change! Lots of bright overdyed colors, they've packed the ringmaster in here, the tiny acrobat on the high wire, trained elephants, the big tent, the flaming hoop that something has to jump through (!) the lion-tamer and his lion, the strongman, the circus clown... and festive floating balloons everywhere! 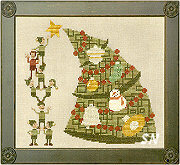 The chart comes with one green star button, but I bet you can come up with lots of other fun embellishments for this! Finishes approx 2 x 17 on 32ct, Cute! Lots of clovers scattered about -- but only ONE with 4 leaves! I see two leprechauns in here... and lots of gold coins! Offered as the chart, this finishes long and skinny just like the rest of the rows. Clay button embellishment package is coming... really dresses these up with cute bits of color! 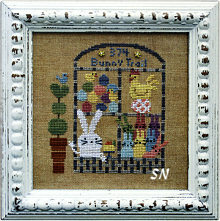 Another of BC's famous Row designs, this one is full of rabbits and chirpy little chicks. 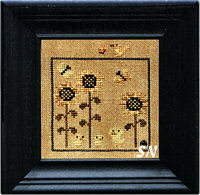 Baskets and flowers scattered throughout, this is offered as the chart, and stitched on 32ct, it finishes approx 2 x 17. There is an embellishment packet coming of clay buttons to dress this up a bit... will have more info about that in a week or so! we'll keep you posted! It's been quite a while since we've seen a lonnnnnnnng row of the alphabet from the gals at Bent Creek... so this was a nice surprise when we opened our fresh shipment! Offered as the chart, stitch ROWmance in either DMC or overdyeds, it'll finish quickly into a 2 x 17 confection! We always had a cute pack of button embellishments available for these rows... I haven't heard any word about that yet... I'm looking into it! Anyway, ROWmance actually features a *tiny verse*... there is a little bee in there, and he's flying around the heart that says B mine! Cute! 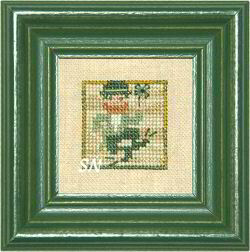 OK... another long and thin line of the alphabet... this one features a few stitching motifs. Like all of the other BC Rows, this one would be really happy if you'd add a bunch of colorful buttons to it! Finishing approx 17-1/2 x 2 on 32ct linen, change some threads, add some fun charms and things from your stash, even a DINKY pair of scissors would be cute on here! Offered as a chart. A separate clay pack includes pin cushions, spools, quilt blocks and little stitching basket that look *so* cute scattered about on this! Bent Creek presents a nifty 'Row' through the year of seasons! Offered as a leaflet -- just like all the rest of the 'row patterns' -- this one finishes approx 2-1/2 x 23 on 32ct Natural Linen, and is stitched in a combination of Weeks and Gentle Art overdyeds. I especially like all the details in this one! 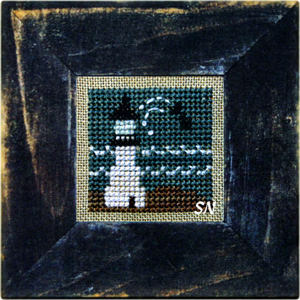 Snowflakes begin the year -- flowers appear in the Spring -- waves surround the lighthouse -- and falling leaves blow Autumn off the right-hand edge! Finishing approx 3 x 18, there is an alphabet included to personalize... and as of posting time... we have no extra button embellishment set. I know there will be one... probably full of lots of hearts... so we're adding a reservation for it and its accompanying placement diagram. Something young and fresh... not too much stitching... this is really nice! Happy Christmas to All! Bent Creek's newest holiday greeting is offered in leaflet format, with the darling clay embellishments, as an additional treat! Stitched on 32ct linen in Weeks Brick, Rum Raisin, Bark and Juniper, along with Dried Thyme Sampler Threads, it measures approx 2 x 17. 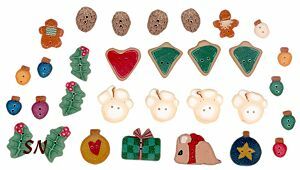 The clay buttons are especially festive this time around, because there are so many new ones included! There are some awesome trees, a 'swirly thing' and ornaments, a cookie and a swirled candle -- real, real cute! We like this one! Another in the Row series, you could stitch this, and finish it into a super-long little box-shape and use it to dress your dinner table! 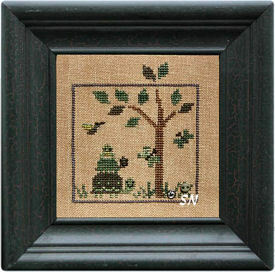 Stitched on 32ct Vintage, it measures approx 2 x 17. Offered as a leaflet, it's worked in overdyeds, and is an 'easy stitch' because there aren't too many color changes. (The overdyeds do it for you!) 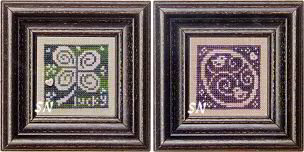 Our friends at Abecedarious -- Bent Creek's local needlework shop in GA -- always do a wonderful job embellishing these rows with fun buttons... so that set will be available any day! So... we're thankful to Bent Creek, the ladies at Abecedarious, and overdyed flosses!!! Trick or Treat... Smell my Feet! Quite the welcoming greeting around Halloween Time! This is just the cutest, stitched in an array of Weeks overdyed flosses. This time around, the words are stitched in three different colors -- Bark, Swamp Water, and Onyx, so there's actually quite a bit of color in here! The button embellishment pack is now ready, too. 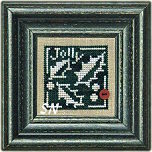 Available as the leaflet, this finishes approx 2 x 17-1/2 on 32ct Dirty Linen, with clay available separately. Gosh, this is cute!!! The newest 'Row' pattern by BC... you might want to stitch this for a special teacher, but then again, you might have to stitch multiples!!! Worked on 32ct Summer Khaki in yummy overdyeds, there are lots of fun school-stuff things on here. Check out the "i before e" rule in there!!! The colors in this are soft and well-worn, like a 'well-loved!' 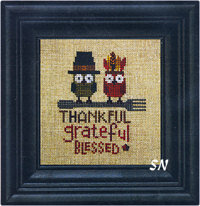 textbook, the motifs are cute, and the whole thing is perfect for your favorite teacher! Bent Creek's local shop -- Abecedarious, in Atlanta, always does fun 'extras' for these row designs full of Just Another Button Company pieces. With TWO A+'s... the frog, apple, and even the worm... this must be quite a special teacher! Check out the little stack of books, too! This clay pack is stuffed full of extra treats for BC's Row this time around! Cute! Offered as the leaflet with clay buttons and placement sheet separately. 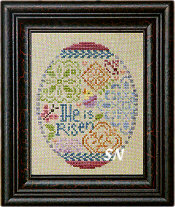 The newest long 'row' chart has arrived... a quick stitch of Easter Eggs, with a simple verse. As always, there will be a cool clay button embellishment pack available this week, that will dress this up quite a bit, and add a bit of whimsey! 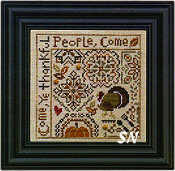 Offered as a leaflet, it finishes approx 2 x 17 on 32ct Lambswool Linen. The 11th of the Row designs... most of the others feature just the alphabet, but Valentine and Easter feature a little verse. The latest alphabet row has arrived... only it's not just an alphabet. Initials carved lovingly on a tree are surrounded by hearts and the Classic Question! Measuring approx 2 x 17 on 32ct Vintage Linen in rich Maple Syrup and Lancaster Red overdyeds, the colors are very Bent Creek. Once again, ABCedarious -- Bent Creek's local needlework shop in the Atlanta area has decorated this row with Just Another Button Company clay! We don't have a price on it yet, so it will show up in your shopping cart as a zero-cost item until we get them in. The placement sheet will come with the button purchase. 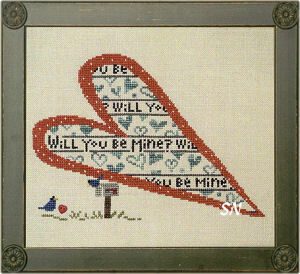 Valentine Row is available as a leaflet. Yet another charming long alphabet garnished with neighborly houses and trees, this is just as cute as all the seasonal Row designs! Finishing approx 17 x 2 on 32ct Summer Khaki Belfast Linen, stitched in both Weeks and Gentle Art Overdyeds, the colors are so rich and pretty. Once again, ABCedarious -- Bent Creek's local needlework shop in the Atlanta area has decorated this row with Just Another Button Company clay! There is a log cabin button, a big man-in-the-moon, and lots of cream and gold stars. Placement sheet comes with the button purchase, Neighborhood Row is available as a leaflet! OK... it's now a contest between cat and dog lovers... which design will sell better??? 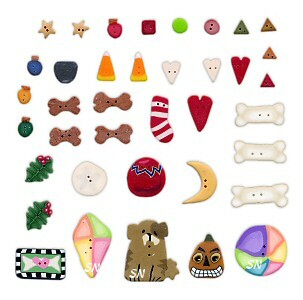 Just released by Bent Creek... Puppy Dog Row has arrived, along with another fabulous selection of seasonal clay button embellishments! OK... I'm a 'dog-person' but this is pretty cute, just the same!!! A long row of placid cats is tucked between the alphabet letters. Available as a leaflet, once again the gals from Abecedarious -- a shop in Atlanta -- have customized this design with a whole assortment of clay buttons to take your kitties through the seasons from A to Z! Stitched with lots of golds, browns, grays -- the little mice! -- , and touches of greens and mulberry (the yarn balls), notice the 'Z' cat is sleeping! Tons of cute buttons from Just Another Button Company, we're offering the chart separately, and the buttons with placement chart, if you're interested. 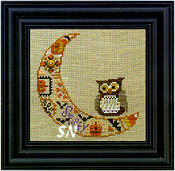 Stitched on 32ct, this finishes approx 1-1/2 x 17!!! I love this! Stitch the alphabet, laced with Christmassy greenery, popcorn and even a fat little elf! 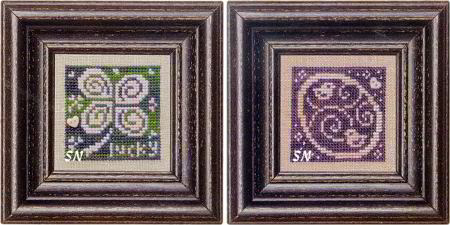 The sixth in this set of designs, these have remained stitcher's favorites! Stitched on 32ct dirty linen, it finishes 2 x 17... long and skinny. 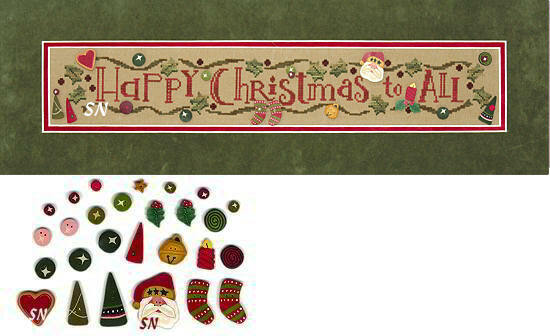 Christmas Row, and all the rest are available as single charted leaflets. The embellishments are just darling! The gals at Abecedarious in GA have done a great job choosing several new buttons this time around. There are four kernels of popcorn featured as well as two new Christmas Cookies! Lots of teeny holly leaves, pine cones and light bulbs... you'll love the set! 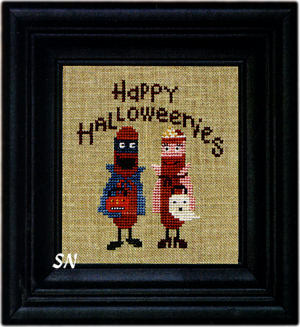 Another very long and thin alphabet by Bent Creek, Spooky Row is full of the cutest Halloween motifs! The cauldron at one end... and my absolute favorite -- that little buzzard/vulture guy down at the other -- this is stitched in black, browns, oranges and creme overdyeds. Spooky Row by Bent Creek now has a package of embellishments! A darling set, it includes quite a few new clay pieces from Just Another Button Company. Notice the cute Jack-o-Lantern guy, and those new "Wild" pumpkins! Cute, each Row-Pack, dreamed up by the gals at Abecedarious in Atlanta, really adds a lot of charm to this series of Bent Creek Rows! The entire series of "Row Designs" is so much fun to have! All our models are hanging together in the shop... and they look great! The next in Bent Creek's seasonal set of alphabets, this one has some little houses and a cute barn flying the flag! Stitched on 32ct Natural linen, in rich overdyeds of red, deep sea, whitewash and bark, it measures 2 x 17"... just like the other four in the set. Of course, the creative gals at Abecedarious -- a needlework shop in Atlanta -- have chosen fun clay embellishments for this. Just let us know if you want them, too! The clay embellishments chosen by the gals at Abecedarious in Atlanta are ready! Darling buttons by Just Another Button Company , the pack includes seashells, turtles, birds, a sailboat, frog, and the sun, along with a few other goodies. This rounds out the set of the four seasons... and each has the special pack of buttons available! The last in the seasonal row charts, this is darling! So long and skinny, stitch the alphabet in a row, and add all the fun summertime motifs! Approx 2 x 18"... it's stitched in a mixture of Weeks and Gentle art overdyed flosses -- sandy colors, and nautical reds and blues. The companion to Winter and Autumn Rows, a whimsical alphabet trails across your fabric, with all sorts of seasonal what-nots scattered throughout! 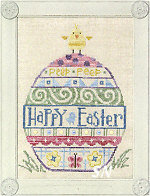 Finishing approx 2 x 17 on 32ct linen, this is a fun collection of seasonal patterns. The gals at Abecedarious -- a shop in Atlanta -- have outdone themselves again, and given us placements for tons of Just Another Button Company clay embellishments! You'll add pansies, bluebirds, ladybugs, doodlebugs, bees and even a caterpillar, along with lots of little flowers. Very colorful, and full of Spring! 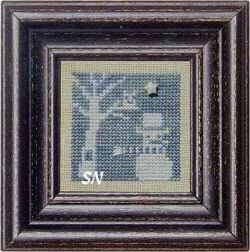 ***The embellishments for Winter Row are also delightful! 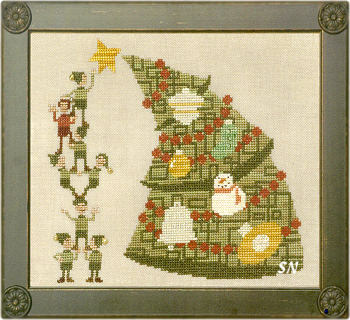 Little evergreen trees, snowflakes, mittens and stocking caps, birds and pine cones... they're so much fun to stitch with, and add to your needlework! This is Bent Creek's design... only decorated with a delightful set of clay buttons! Again we credit the artistic talents of the shop Abecedarious (pronounced: a b c darious!). Such a fun selection of pumpkins, acorns leaves and blackbirds... you'll need this! Really cool! The final installment of the Halloween Branch is here... oh my gosh... it finishes off with a DARLING little haunted house on the tip of the branch! 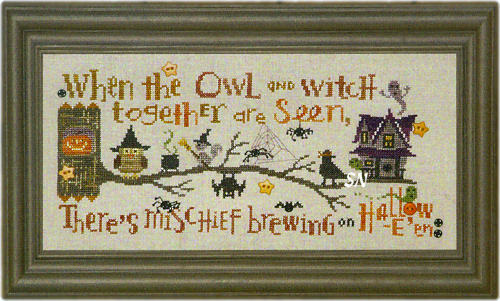 There is so much going on in this piece... what fun to stitch! Measuring 5 x 11 on 32ct, you can choose any fabric you like, and you can use either DMCs or overdyeds from your stash. OK... Bent Creek has now finished 4 of these Branches - and we have them ALL -- COMPLETELY! Check out the Original Branch, Christmas, Patriotic and now Halloween. All four are really cute sets of smaller charts that all fit together... we can send parts of any of them... or wholes! 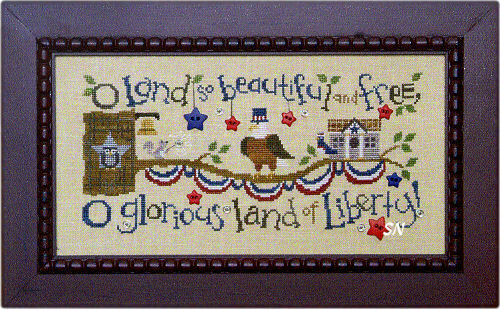 Liberty Belle Squirrel is part one of Bent Creek's new Patriotic Branch series! Patterned just like their other two Branch sets, this will be offered in 3 parts, all in chart format with a few button and snap embellishments. Stitched on 32ct linen, the entire piece will finish approx 5 x 11, and is worked in both Weeks and Gentle Art Sampler Threads. The border pack contains the 5 star buttons you see on here... the rest is a surprise! 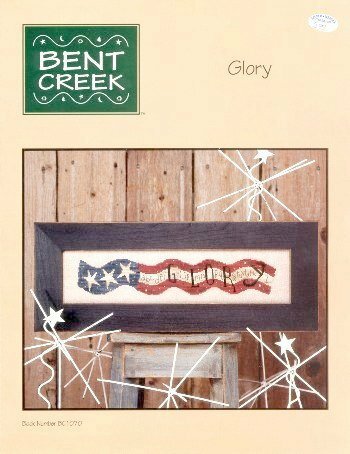 UPDATE: Bent Creek has sent the final installment of their Patriotic Branch 3-part design -- JUST in time for the 4th! It finishes with a white bird house perched on the end of the branch. Quite a cute piece, the whole thing finishes approx 5 x 10 and is stitched with your stash of overdyeds. Each chart includes a couple of snaps and a button or two. Something fun to display all year long! Anyway, this promises to be another cute set of small designs -- this first installment includes the border and embellishment packet. Finishing approx 5 x 10 on 32ct, uses overdyeds from your stash. Our Auto-ship has now concluded. Fabric is not included... as you have so many choices! Pick a favorite! 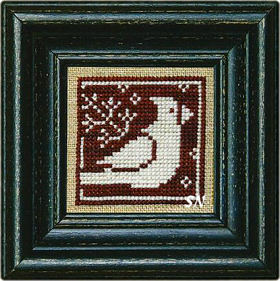 Offered in a set of 5 small charts... the owl, tree, border and button embellishments come in the first chart, then the Bees, Squirrel, Kitty and now Bird House, each come as separate small charts with a snap embellishment. This has been a real popular piece; check your stash to make sure you haven't missed any of the parts! A big statement concerning LUCK... this baby finishes a whopping 11 x 13 on 18ct over two... but can always be stitched into a more petite size on smaller fabric! Stitched with size 5 Perle Cottons, this works up super-quickly, and is really fun because you cover a lot of fabric very quickly! 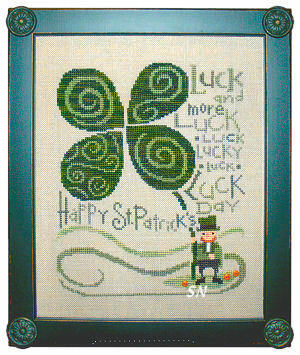 The Shamrock is stitched with Weeks hand-dyed perle -- the color is Collards -- and the chart includes 3 'gold coin' button embellishments. The newest gigantic Bent Creek creation... these are stitched on 18ct linen with Weeks Hand-dyed #5 Perle cottons, along with some solid DMCs. Even though this Valentine is *uber*... it was gentle in delivery... the little mailbox is intact! 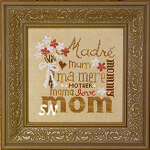 Finishes approx 13-1/2 x 11. Just a real different, eye-catching piece, this would be great finished as a gigantic pillow for the couch, or something to perch under the empty tree, till Santa comes! Is this guy cute, or what? He BEGS to be stitched on 10ct with specialty threads (Very Velvets and Fyrewerks)... but right now, he's pretty awesome on 18ct linen with overdyed flosses or size 5 perle cottons, (your choice!) 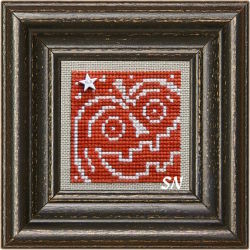 Stitch count of 98 x 120, his colors are great, and because of all the solid areas... he'll be a breeze to stitch! What a cute, huge, swirly pumpkin! 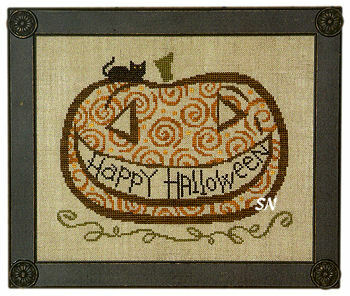 Offered as a simple chart, this is just a big Jack-o-Lantern stitched with overdyeds on 18ct linen over two. OK... look at it. Start thinking. Clay JABCO cat instead of the stitched one? Metallics in those bitty dots in the background? What about metallics in the swirls? What about halloween-y clay buttons scattered between all those swirls? What about black Fyrewerks for the eyes... and cute embellishments in the vine below him??? THIS HAS POTENTIAL... because it's a great basic piece! 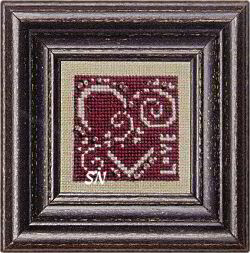 A generous 11 x 13-1/2 inch piece, you get to stitch this one on 18ct linen over two threads and use #5 Perle Cottons in Weeks and DMC. Regular crosses, the flag stripes have a bit of design to them, that's kind of fun. This would be pretty made into a pillow for the couch, or framed on the wall. I had never heard the term *Uber* (pronounced U BER) till this pattern came... and received a short education into current slang terms in the English language. Uber -- these days -- means really, really big. (as in Super-Duper!) Well, this egg *does* deliver that persona! I don't know if you can see the little chick standing on the top of the egg... but he is PRECIOUS! Then, you stitch your egg with different bands of patterns, and embellish one of the rows close to the bottom with a set of 7 pastel buttons. 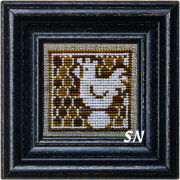 Uber Egg finishes approx 11 x 13 on the suggested 18ct linen... using #5 perle cottons! 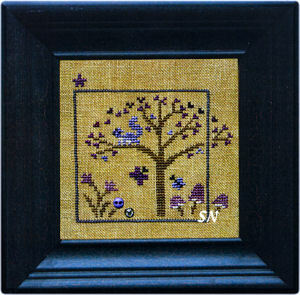 If you choose smaller fabric, such as 32ct, it would finish approx 6 x 7-1/2 in size. Offered as the single chart with buttons, fabric is up to you! 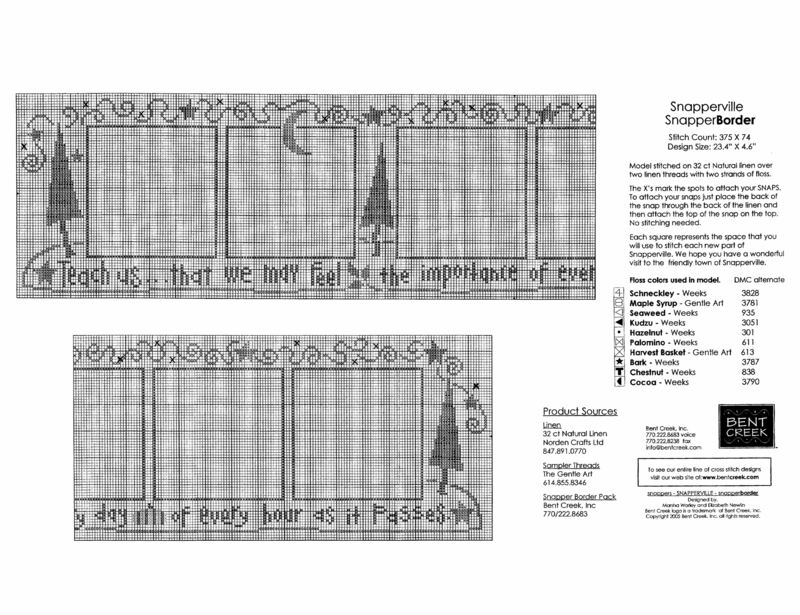 Bent Creek's 8th Christmas Stocking design, this one is full of gigantic Quaker-inspired motifs -- kind of like a coverlet. Stitched on 18ct Natural Linen in shades of overdyed #5 Perle Cottons... if you're a floss gal... you can do all on the 18ct with 4 strands of corresponding flosses. 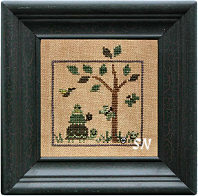 A pretty collection of greens and reds, the chart comes with one red button embellishment. In looking at this, you could add charms and such that match the stocking owner's personality, as well. Very pretty. 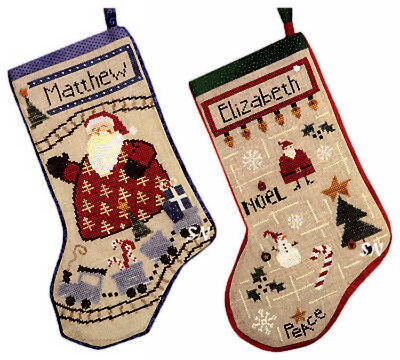 Check out the entire collection of Bent Creek Stockings, all in one place, too. 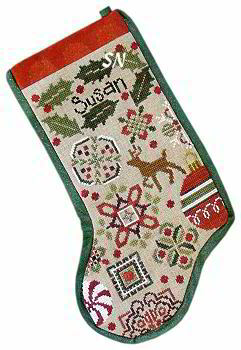 Bent Creek's 7th Annual Stocking design... 12 Days is a medley of motifs from the famous poem. I had to look a little for the five golden rings!!! Offered as a chart, it finishes approx 11 x 16 on the 18ct Natural -- just like all the rest. 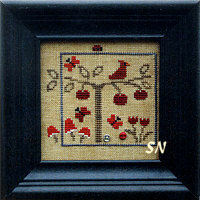 Embellishments included with our chart include 5 red and golden buttons. 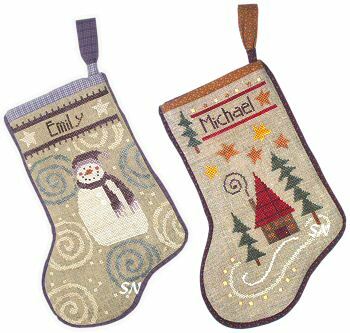 Bent Creek's newest Christmas Stocking designs... these two bring the set to 6 in all! (Just scroll down this page to see the rest of them... they're all still available!) 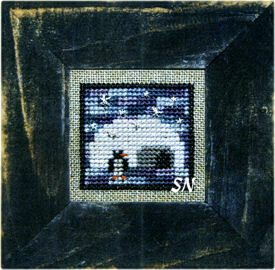 Jane (Christmas Carols) features a family of caroling snow people beneath the lamp post. Zachary's stocking (Christmas Eve) features Rudolph, himself, pulling Santa's sleigh!!! Offered as leaflets, each stocking is stitched on 18ct Natural Linen using 4 ply of overdyed Weeks and Gentle Art flosses. Complete alphabets are provided for personalization... so you have no excuse to have these done by Christmas! 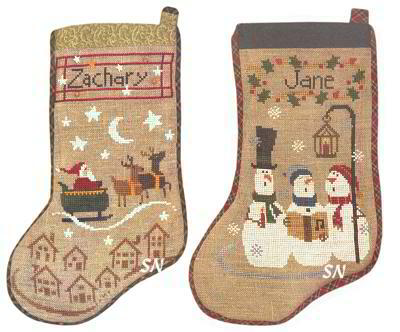 A very nice set... they aren't 'cutesy, juvenile, or over-the-top involved'... just really nice family stockings! Each finishes approx 11 x 16 -- perfect for lots of loot!!! Two new leaflets have arrived that offer charts for two of the most charming Christmas Stockings!!! 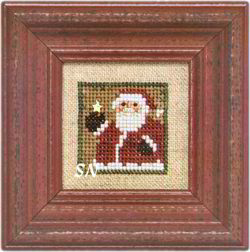 Stitched on 18ct Natural Linen in yummy Weeks and Gentle Art Sampler Threads, each finishes a nice 11 x 16 -- which is large enough to hold Santa's precious gifts! Each one has a smidge of Just Another Button Co clay button embellishments, and they join the other two stockings that Bent Creek has already introduced. Each of these is really nice... not trite or juvenile looking ... just really classic -- and that will last for years and years to come! Offered as leaflets with fabric and buttons available separately, our stocking cuts of linen are fat-quarter yards of linen, because that is the most economical way to purchase. You'll have enough linen left over for an ornament or two! Here's a stitching opportunity. Kind of a blank canvas here - Customize this to make YOUR Day Good!!! Change out that black for COLOR! Add a birthday cake if 'today' is a birthday. Add some cute colored buttons, or use some metallic threads to brighten this. The sentiment is good, the font is funky and fun, the heart and flower in there beg for a little pizzazz... see what you can come up with! Then, finish it into a block or easel stand-up so you can display it all over the place!!! Finishing approx 5 x 5 over two on 30ct, this is coded for DMC or hand-dyed flosses. If you stitch it smaller, you could make a heart-shaped little cushion!!! 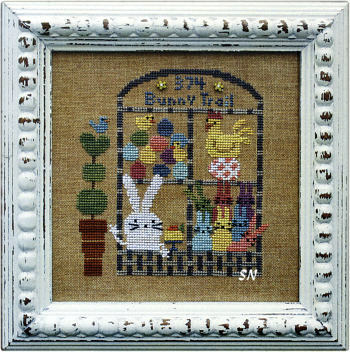 This is supposed to be a front door... the 374 Bunny Trail at the top is the street address of the Bunny household. They have a lot of kids... wee babes in the upstairs bedroom, Mom working on another one, tons of kids on the first floor -- hopefully just a sleepover and not seven more bunnies in the family! Then, there's Dad, answering the front door with a carrot cake!!!! 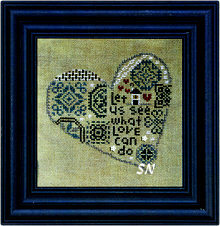 Finishes approx 5 x 5 on 30ct... choose any fabric you want for this... coded for hand-dyeds and/or DMC floss. Oh my gosh, these little guys are so cute! A pair of owls dressed up as a pilgrim and Indian... they ARE grateful, thankful AND blessed! That fork is great, too! They just look like they are SO disguised... you'll never know they're owls! 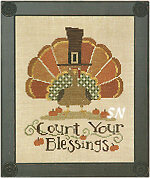 Presented as a small card chart... just a fun 'little something' for Thanksgiving! Wedding Cake - 'Your Color'! A simple tiered cake with special initials and date... you choose the colors of the wedding to work this in! 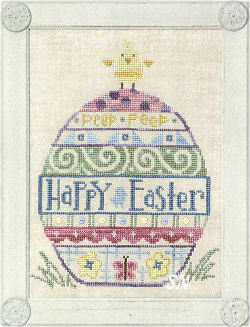 Offered as the small chart, this finishes just 2 x 3, and it would make a SUPER CUTE gift tag!!! A BITTY 24 x 24 thing... stitch this on anything you want! Less than an inch over one on 28 or like 3-1/2 inches on 7ct! 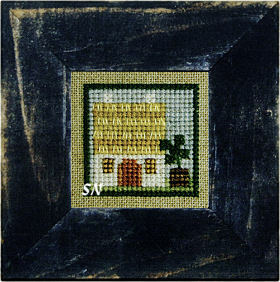 Bits of flosses from your stash, the roof is regular Cross Stitch with straight stitches over it to make it appear thatched. Check out the Lucky Landscaping as well! Cute, this is presented as a small chart. Oh, another charming ITTY BITTY design, this one is a wintery sky surrounding a little igloo -- complete with a dinky penguin that is only 7 stitches high!!! 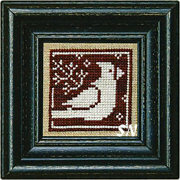 The entire picture measures only 24 x 24 stitches -- all of these are absolutely charming! Offered as a small chart. Almost not-in-the-Nick-of-Time for Christmas... you'll be a whole year ahead of schedule with this!!! Oh, this is CUTE!!!! 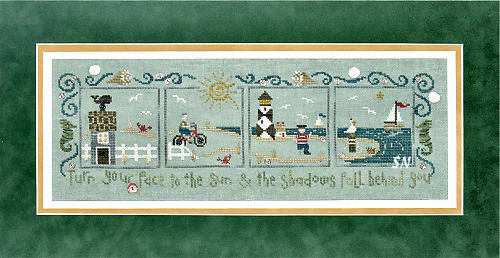 It's one of Bent Creek's *Littles* charts and has a total stitch count area of only 25 stitches. Using a combination of DMC, Weeks and Gentle Art hand-dyeds, it's a sweet bitty design that could even handle a few beads for candy bits -- if you have any in your stash. 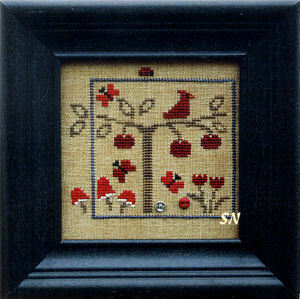 Otherwise, just plain stitching in this petite little piece, which is presented as a small chart. New Arrivals From Bent Creek! 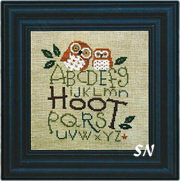 Hoot -- A cute little pair of owls... stitch them with or without the alphabet! 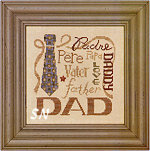 The entire design is 82 x 88, and those little guys are worked in Nutmeg, Whitewash, Pecan, Cidermill Brown and Gold Leaf! Offered as a chart. Winter REDBird -- The final in this 4-seasons set of monochromatic birds... it joins Golden Spring Chicken, Summer Bluebirds and Autumn Blackbird. 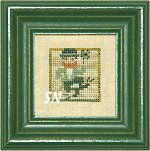 Finishes just 2 x 2, Bent Creek is up to 13 of these small charts that are worked in one color. Very simple, but REALLY eye catching when you gather them all together into a charming basket of handmade cushions or little stand-up cubes! Little House Haunted -- Another dinky design -- a teeny weeny house on a hill haunted by a HUGE and scary ghost! Tiny Nativity and Little Lighthouse are small like this one -- they all finish ONE INCH in size if you go over one on 25ct! This is another of BC's monochromatic smalls -- choose a color and add white. 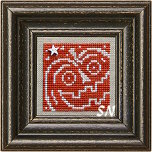 Stitch count is only 32 x 32... so he could turn out to be only an inch if you do him over one on 32ct! All of the designs in this set look really nice stitched and presented together -- pin cushions, fobs, cubes -- just do them all the same -- the only things that change are the main color and the simple design. Lots of visual impact. Presented as a small chart. That's it! 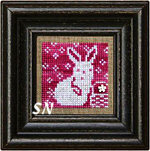 Stitch count of 24 x 24, would you believe there are 8 different colors in this?! Presented as a small chart. 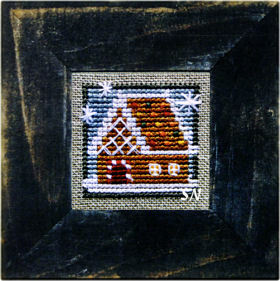 Here is another *Color + White* small design that is stitched with only one color of hand-dyed thread and white. There are quite a few of these now (like 12), and Summer Bluebird is the third in a four-season set of them. Stitch counts on all of them are only 32 x 32 so they make CHARMING scissor fobs or ornaments -- especially if you do them on something small over one. All the *Color + White* designs are offered separately as small charts. Real cute made into individual stacking blocks, too! 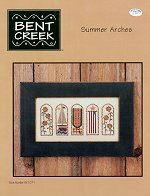 Here is another small design by Bent Creek that is stitched with only Gentle Art's Whitewash and one other color -- this time Gold Leaf. There are several other designs in this set -- all of them finish only 32 x 32 in stitch count. It looks like Golden Spring will be the first of 4 seasonal birds, they have the other three pictured on the back of this chart. We won't do an auto-ship on those as there is no information about future release dates on them. Offered as a small chart. 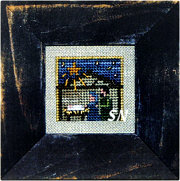 Quite a historic event is taking place in this tiny 24 x 24 stitch count manger scene!!!! 12 Different colors of hand-dyeds in this little guy, if you work it over one thread on something small it'll finish LESS than an inch in size! On 14ct -- it'll be 1-1/2 inches. Offered as a small chart, there are a few gold seed beads in here for the sparkling stars in the sky!! What do you serve at a Halloween Party???... Halloweenies! *Ya gotta have* the right place to display this!!! ... or maybe some special little people in the house who'd get a laugh. 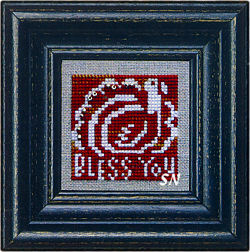 Offered as a small design, pull threads from your stash to work up this 5 x 5 bit of silliness. 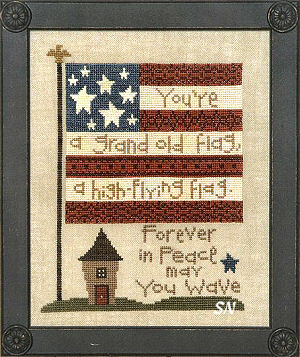 All offered as small charts, each measures a mere 32 x 32 stitches -- so just 2 inches if you work them over two threads on 32ct. They all require one skein of a hand-dyed color of floss, and Whitewash Weeks floss. Every one of them comes with a cute button embellishment. Just a charming set of designs... I think we have finally gathered them together for you on the page!!! 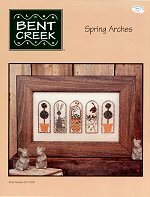 Remember the old Arches designs by Bent Creek??? Here is a new one -- to celebrate Halloween! 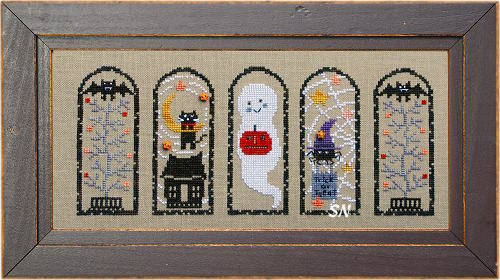 Offered as the chart with a trio of golden star buttons, each little 'window' features a small but scary little scene. So cute... we've seen these individual panels finished as fobs and ornaments... but together they finish approx 9-1/2 x 4 on 32ct. Stitched with DMCs or overdyeds. 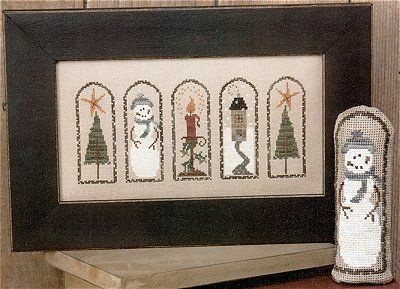 Here is a beautiful set of seasonal designs! Each has 5 little panels depicting things special to its particular time of year! 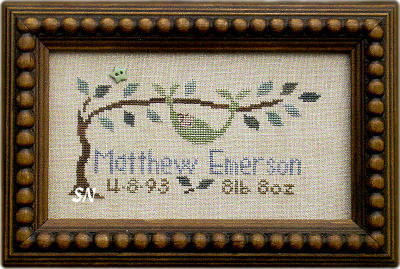 Each season finishes approx 4 x 9 1/2" on 32ct linen... but look soooo good on large counts, too! Each is stitched with Week's Dye Works overdyed floss to really give it depth. Wouldn't some fun, nubby or metallics be fun on these? There are tons of clay, ceramic, and glass embellishments the I can think of, too! 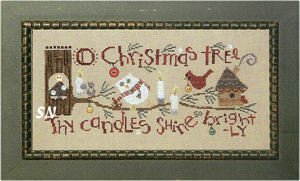 Here is the most wonderful design adaption, done from all four of the Bent Creek Seasonal arches patterns! The ladies from the shop Abecedarious in Georgia are the creative stitchers behind this! 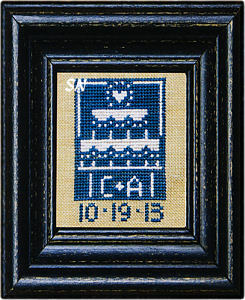 They've taken one arch to signify each month... stitched them in one long row, and added all these cute Just Another Button company embellishments! The stitched piece is just breathtaking! We have the leaflets if you need any or all of the four original designs, and the wonderful clay embellishment pack. There is also a button placement sheet that will come with your embellishments! Wow... this is quite nice! 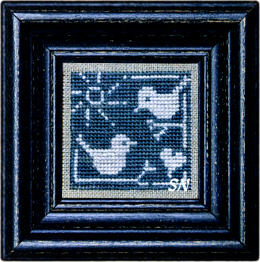 A Quaker-inspired piece -- it's about 1/10th the size of most of the intricate Quaker samplers that we see, so it's finishable!!! With a stitch count of 80 x 80, get out your overdyeds and stitch that darling turkey! 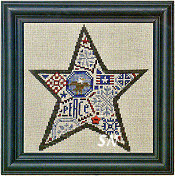 Offered as a chart, it includes a trio of golden star buttons. We like this one! 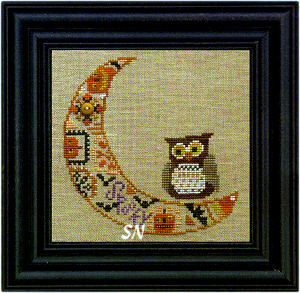 Here's a fun Halloween design -- the crescent moon surrounding the cutest little Mr Hoot! 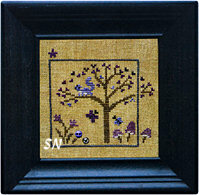 Offered as a chart with gold button embellishment, all is stitched in overdyeds on 32ct. Finishing approx 5 x 5, the moon slice is full of jacks and bats -- and even a candy corn on the bottom point. 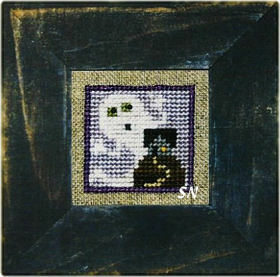 You know, there is enough room to stitch something like *Boo Who? * in the upper right-hand area! Or... separate that little owl -- he's precious! 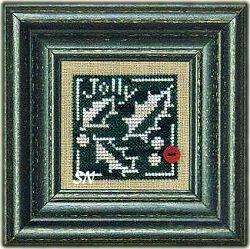 Stitch this on almost anything you like -- the chart calls for Gentle Art and Weeks flosses, with DMC alternatives... so even Perle Cottons on something gigantic would be possible. 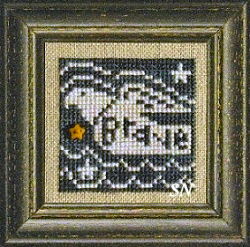 Offered as the chart, there is one dark red star button included, but this design offers so much opportunity for more -- so see what is in your stash!!! Welllll.... this isn't exactly a pea vine, and the embellishment isn't a pea, but little sleeping Matthew looks pretty comfy in his hammock bed anyhow! Colorful and delicate, check out the little hatching chick in the center! Bent Creek offers this egg in chart format. On 32ct, it will finish approx 4 x 5 and is stitched in either DMCs or our stash of over-dyed threads. The companion to Love You Mom... we missed Father's Day with this one, but you love Dad anyway... no matter the day! 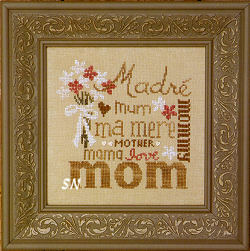 Just a bit late for Mother's Day this year... it's OK... because you need no special holiday to tell Mom that you love her! Bent Creek's newest leaflet, this is stitched on 32ct Summer Khaki Linen in Weeks and Gentle Art's overdyeds of Cocoa, Whitewash, Harvest Basket, Antique Rose and Dried Thyme. 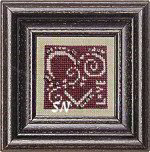 Finishing approx 5-1/2 x 5-1/2, it features three tiny coffee-dyed heart buttons as embellishments. Soft, antiqued creams, green and rose... whatever name is special for your mother... this tells her you love her with a splash of elegance and soft color. Offered as the leaflet with linen and buttons separately. A tiny design offered in small card format... this little guy finishes approx1-1/2 inches square on 32ct linen. Teeny-weeny, he's perfect for a scissor fob. BC showed a model at Market of 5 of these 'Littles' all stitched together in a row... it was that 1-1/2 an inch high x 7 inches long. Perfect as a dinky cube-shaped stand-up... the collection was precious! Here's a fun little chubby guy that finishes really dinky! (Hence, the 'littles' in the title!) 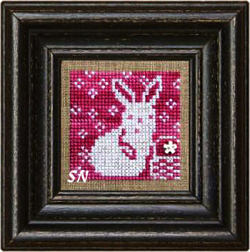 Offered as a small card, if you stitch this guy over one thread on 28ct... he's LESS than an inch in size! (You could make a teeny scissor fob.) Over two on 28, he measures 1-1/2 inches square. The card comes with the small brass star embellishment, and the design uses just bits of overdyeds from your stash. Cute! This is a beautiful long, skinny flag stitched entirely in overdyed flosses. On 28ct, it finishes approx 2 1/2 x 14... so it'd be a lot of fun to hang in a long skinny place!!! Notice how the word "glory" is alphabetical in the alphabet! This one would be neat stitched with bright metallics, too! Lots of possibilities!